How to batch download popular songs from Audiomack on Mac/Windows? Download, capture or record online videos from 100+ video/audio sharing websites. As one of Soundcloud alternatives, Audiomack offers music lovers a place to listen songs and artists to effortlessly share songs and mixes. Trying to download albums from Audiomack with high quality? How to download hip-hop or electronic music on Audiomack in batch? In this guide, we will show you an all-in-one music downloader - Bigasoft Video Downloader and detailed guide on how to save Audiomack music to MP3, M4A, WMA, AIFF, OGG, etc. 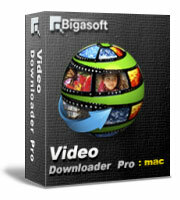 Bigasoft Video Downloader Pro is one of the top ranked Video/Audio downloader which helps to download, capture or record videos and live streamings from more than 100 video sharing websites, including YouTube, Facebook, Dailymotion, Vimeo, Yahoo Video and F4F video sites, etc. Besides, it is also a local video converter. With it, you will be able to make both your local videos and online videos to be played on popular digital devices such as smart cellphones like iPhone (including iPhone 6 and iPhone 6 Plus), Sumsungs Galaxy, BlackBerry and pads like iPads, Note, and even PSP, PS3, Xbox, Archos, and so on. Download and install the ideal Audiomack Music Downloader - Bigasoft Video Downloader Pro. There are two different versions for Windows and Mac users separately. And the two versions are fully compatible with the latest OS. Copy the URL of the song or album which you would like to download. 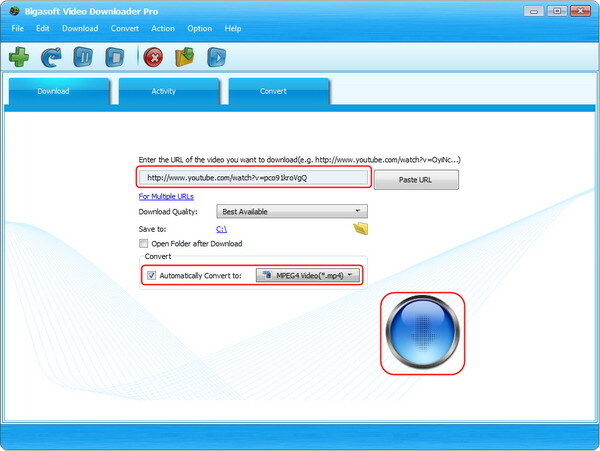 Then paste it to the URL box on the Download panel. As soon as you have copied the URL of the Audiomack music and mouse over the Past URL box, the URL will be pasted automatically. Click "Save Folder" button to choose the destination folder for the downloaded Audiomack music files. If you prefer to save the music in a different audio format, just click the small triangle to the right of the "Automatically Convert to", a drop down menu will pop up, select your desired format from the Audio category. Click the "Download" button to start and finish downloading music from Audiomack. From Activity panel, you can check the downloading process. Besides Audiomack, you can also download music files from VEVO, MTV, SoundCloud, Yahoo music, Goear and any other music streaming sites. Download and have a try now! Posted by Harvey Taylor. By the way, you may join me on Google+.